What Does the Preacher Preach On? 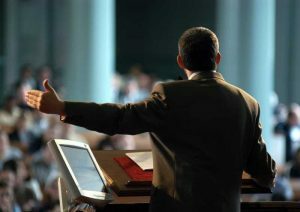 Have you ever noticed patterns in the lessons coming from a preacher? In other words, does the preacher seem to constantly preach on a specific topic or theme? Does there seem to be an agenda underlying the lesson choices? This is an interesting topic for me—both on a practical level for myself and then as a student of church history. There’s a danger in developing a pattern or habits when it comes to what is being preached. Really I suppose there are two significant dangers. First, if a preacher focuses on one or two themes then many others are getting left out and the congregation isn’t going to receive the meat they need. The second danger is a little more practical. It can create problems for the preacher within the congregation. It’s simply more likely to alienate people who don’t share in the same concerns, interests or motives that led to that particular focus. This is a common problem for many preachers. Sometimes it stems from a lack of confidence. Other times it might be motivated by the current trends that are prevalent in the Church. And sometimes it’s simply a result of a specific agenda. I was recently reading through a book of sermon outlines by Gus Nichols. If you’re not familiar, he was one of the more well-known preachers of the early 20th century. His strongest influence was in Walker County, Alabama. In this book, there are 122 sermon outlines. Here’s the breakdown on a few of the topical themes represented. This only accounts for about a third of the sermons. So it’s definitely not a true representative sample. However, aside from funeral sermons (of which there were nine), there were no other themes that showed up more than four times (prayer). Even after looking at this for just a moment it’s easy to notice some significant discrepancies. How can a Gospel preacher who experienced so much tangible success and is held in such high regard only have preached on Jesus, love, and grace a total 6 times in a sample of 122? That doesn’t make sense! That is so far removed from the nature of Christ’s preaching, Paul’s preaching and the entire theme of the Bible (including a lack of OT sermons). Jesus himself said that love is the greatest command (Matt 22:36-40). Perhaps the greatest evangelist ever (aside from Jesus himself) was Paul; and when the topic came up he simply stated that he didn’t preach anything but Jesus Christ crucified (1 Cor 1:23). This is an example of what can go wrong when a preacher consistently chooses topical over expository preaching. What’s the solution or answer to this potential problem? Well, there seem to be two answers. First, do what Paul did. He preached Jesus Christ crucified, at least to the Corinthian Christians. Second, limit the number of topical sermons and spend the majority of the time just preaching through texts. For example, pick a book then preach it passage by passage. This limits the opportunity to interject an agenda and proof-text your arguments. It’s tough to go wrong by taking a passage, figuring out what it says and then applying to the current culture.